Shooter Call of Duty: Infinite Warfare took the No.1 spot in the November charts, making Activision Blizzard the No.1 publisher in both units and value for the month. Boxed unit sales were down 26 per cent compared to Black Ops III’s first month, though. 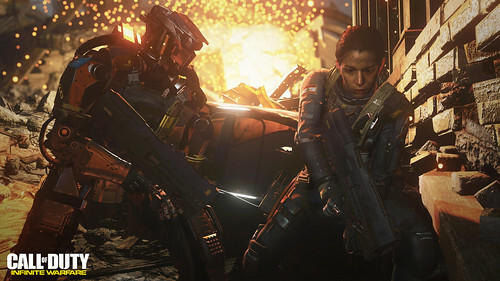 And Activision’s shooter was not the only one to be affected by a decline, as the market as a whole has seen a 6.3 per cent dip in unit sales year-on-year. According to GfK’s figures, 3.9m games were sold between October 30th and November 26th 2016, whereas 4.1m units were shifted during the same period last year. However, data was collected a little earlier in the month last year, from October 25th to November 21st 2015, and didn’t include the crucial Black Friday weekend, which makes this year’s figures look weaker still. Agreed. The campaign in CoD: IW was pretty good, i enjoyed it. Multiplayer is merely okay. Titanfall 2 has a better campaign, and better multiplayer. Battlefield 1 has a decent campaign, for a game from DICE (admittedly a low bar) and very good multiplayer.